CROTONVILLE, NY—In 2001, GE commemorated former CEO and chairman Jack Welch’s retirement after 20 years of service by renaming its corporate training facility in Crotonville, NY in his honor. The site is used by GE executives for high-level training classes and meetings, but it is also available to teach employees at all other levels within the organization. In an effort to save travel time, expenses, and environmental impact with a reduction in companywide travel, GE chose a Cisco Telepresence solution for the facility. GE’s Jack Welch Corporate Training Facility in Crotonville, NY features an IVCi-integrated Cisco Telepresence solution. Crotonville’s Lyceum conference room was chosen to be a multipurpose Telepresence room. It had been used for training and presentations, but it lacked the equipment that would create a highly realistic meeting experience. Industry expert and Telepresence system integrator IVCi worked with Timothy Peterson, GE’s lead deskside support, and Helio Muro, a Cisco engineer and Telepresence expert, to create a custom solution that would transform the Lyceum room into a Cisco Telepresence environment. 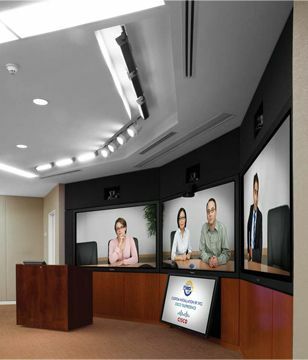 Although GE currently has 18 Telepresence locations throughout the corporation, the Lyceum room is unique because the system was tailored to an existing room configuration and is therefore not a standard Telepresence solution. “Working with IVCi, we took the core Cisco technology (the cameras and codecs) and built an authentic experience for the client,” said Roy Skillicorn, senior director of AS services. Display devices include three 103-inch Panasonic displays on the front wall, one 65-inch Panasonic display below the plasmas for viewing content, two additional 50-inch displays for content support, one 42-inch Panasonic display for additional viewing during a Telepresence call, and a Smart Sympodium interactive pen display. The three large plasmas are located on a custom steel wall structure with a motorized tilt mechanism that was designed by IVCi and fabricated by Custom Display Solutions. To represent a live meeting experience, a total of 30 ClockAudio intable microphones with an FSR pushto- talk custom ring and ClockAudio ceiling-mounted microphones are capable of being on all the time so that participants can speak freely. Integrated into a Biamp AudiaFLEX Audio Matrix with Tannoy wall-mounted speakers, dual concentric ceiling speakers, and wall-mounted left-center- right speakers, the microphones also feature a “look at me” function. When the speaker pushes a button, a camera will zoom-in and deliver a head shot to the far end. A Crestron control system offers four modes of operation: presentation, conference, Telepresence, and tools for administrator functions. The room’s eight video sources can be sent to the left, center, right, or support monitors. The videoconferencing system includes multiple Cisco Telepresence codecs and cameras, Sony HD video conferencing cameras, Extron amplifiers, Barco HD image processors, and Aurora Multimedia HDMI matrix switchers. To help ensure the optimal Telepresence experience, transitioning between camera shots needed to be smooth. Given the 60-person capacity of this room, the cameras were configured to pan or zoom-in on one participant and matrix switchers allow for the smooth transition between room and close-up views at 1080p resolution. Nina Parker (nparker@ivci.com ) is the marketing director at IVCi (ivci.com). Based in Hauppauge, NY, IVCi is a leading integrator of Telepresence and HD video conferencing solutions, audiovisual systems, and managed conferencing services.